The buyer will acquire a long-term registered lease over the Premises of the Hotel. Their interest will be registered at the Land Office and will therefore constitute a secure and legally recognised right over their Units. Under current Thai law, the longest registered lease period is 30 years. Therefore, in addition to an initial lease for 30 years, the buyer/lessee will also be granted irrevocable lease renewal options for two further thirty (30) year period. 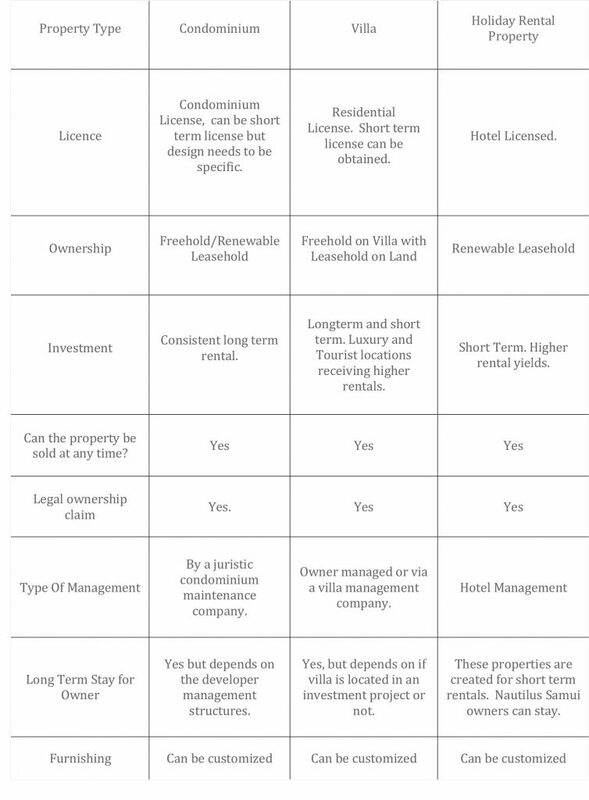 These lease renewal options are contractual rights. The concept of Holiday Rental Property can be sometimes confusing as they are often priced and treated the same as condominiums or apartments. A Holiday Rental Property such as Nautilus Samui Hotel is a pure real estate investment product which is usually purchased for the purpose of earning rental revenue from a place with a booming tourist industry such as KOH SAMUI. They are properties that allow you the opportunity to invest in the tourist industry while earning good rental. Your choice, your money: You can earn a guaranteed yearly rental income of 8% or else opt for a split income between the hotel's management and yourself! Copyright © 2017 Designed by DX. All rights reserved.